Do you get lists of selected photos from clients? The challenge is how to transform that list into a selection of photos in Lightroom, without manually copy and pasting them. This powerful plug-in reads a list of photo file names from a text file or from the clipboard and collects them into a collection called "LRS_Photo_List" for further processing. Your clients do not have to type the full photo name when using the Folder or Collection filtering. So 108, 123.. for example would be sufficient in combination with (part of) the folder of collection name. Another usage might be searching for photos in Lightroom with a similar file name. For more information, see section "How does "Photo list importer" work?". Finally, because the search mechanism used is identical to that of the Smart Collection, you can even create a list for example of clients names, or other parts of your file names, see samples below. How does "Photo list importer" work? Youtube demo of older version. Explains the functionality. See screenshot below for the new, extra options. This plugin turns a list of (partial) photo file names into a collection in Lightroom for further processing. 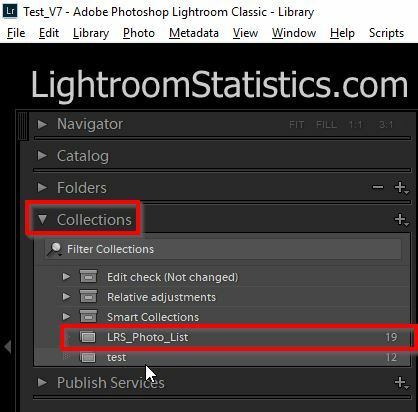 If you have clients that send you a list of their choice photos, this plug-in will transform that list in a Lightroom Collection called "LRS_Photo_List" for further processing. Perhaps you are wedding photographer. After the shoot you publish the photos on your website and have your clients pick those they like. They might send you an e-mail with the names of the photos they choose. Just copy the list with file names from the e-mail, past them into this plug-in and they are ready for further procession in a Collection called "LRS_Photo_List". Another usage is to find all photos in your Lightroom catalog with a similar name like the list provided, see explanation below. Default settings are provided to keep it simple! Only ASCII and UTF-8 characters are supported by Lightroom / this plugin! This plug-in can search in 2 different search modes. This search mode can be used if your list of file names contains the full path and file name of the photo as stored in your Lightroom catalog. The plug-in treats commas as a separating character, meaning that the plug-in reads a line until it finds a comma. If you path or file name contains commas, you should put double quotes around it. Only the file name or part of the file name, see samples below. 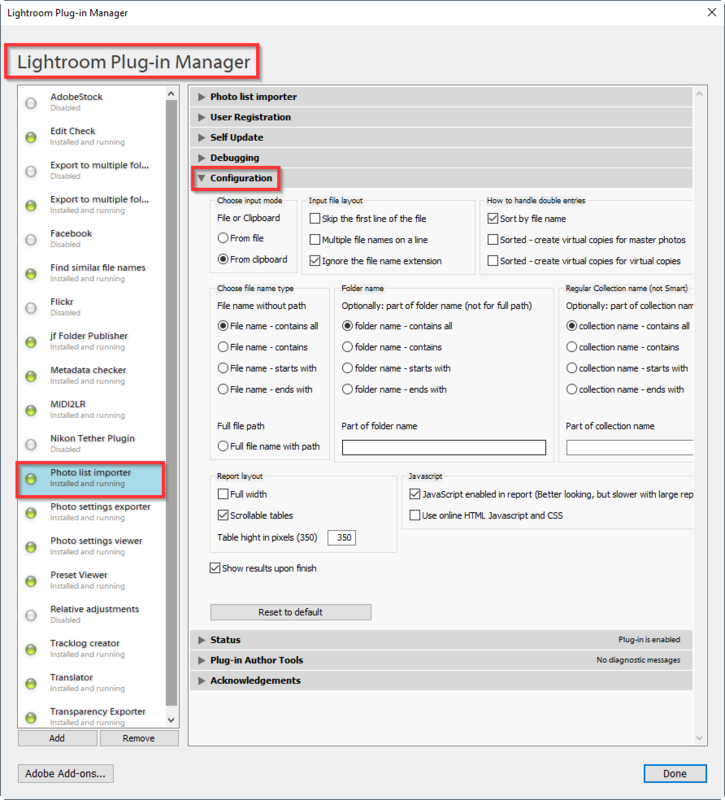 Working with clients and uploading the images to a website they can choose from, the full path and file name in your Lightroom catalog can not be used. For this situation the (Part of) file name only search mode is created. The "File name only search mode" searches exact the same as with smart collection. Default this plug-in reads the first file name from each line. The first file name contains all the characters until the first comma on a line. When your file or path name contains commas, you should enclose them with double commas! Other information may follow the comma, yet this is not processed. In this mode one line may contain multiple file names on a line, when separated by commas. This option allows your clients to supply only a small part of the file name, making it very easy for them. For example, if you shot a wedding of John and Mary and all the photos the couple can select from are in one Folder of Collection, then instead of DAH_20130112_0001 your customers only have to write down for example "0001". Normally there would be many photos with "0001" in the name, but when you supply the the name of the folder or collection, then only the right photos are selected. These filter are based on Lightroom Smart collections and work exactly the same. Normally only a part is already sufficient. This can be a lot of images. In my case all images that I shoot start with "DAH", so all these images will be found. DAH 20130112 9349 Start with File name only All images that start with all this file name. In my case no images are found, because all my images have underscores. Amazon Contains File name only Will find all photos that have "Amazon" in it. So when you are working for clients and you have the client name in your file name, you can search for it. Amazon_2011 Contains File name only All photos made for Amazon in 2010 or 2011. For more information on the search rules in Lightroom like contains all, see the Lightroom help. Below the situation when a user searches throughout the Lightroom catalog for photos contain the numbers given in their name. The search is catalog wide because no extra (part of) folder name or collection name is specified. In this sample the same numbers are supplied however only photos stored in a folder containing "Antwerpen" should be found. As you can see below only photos stored in a folder contain the name Antwerpen are found: 2014_10_15 and 2016_05_19. Of course the same holds true when using a Collection name instead of a folder name. As said, only regular collection names are allowed. Lightroom does not support searching in a Smart collection. For more information see our forum. File or path names that contain comma's should be surround by double quotes. This plug-in can read CSV files, however only the first columns is used. The result of the import is stored in 1 Collections in Lightroom:"LRS_Photo_List"
Also a report is created showing the search results. By default this report is opened after running the plug-in. In the configuration you can disable this. This option is special for importing CSV (Comma Seperated values) files. In these files often the first row contains the column name. When reading from the clipboard you probably always should uncheck this option. 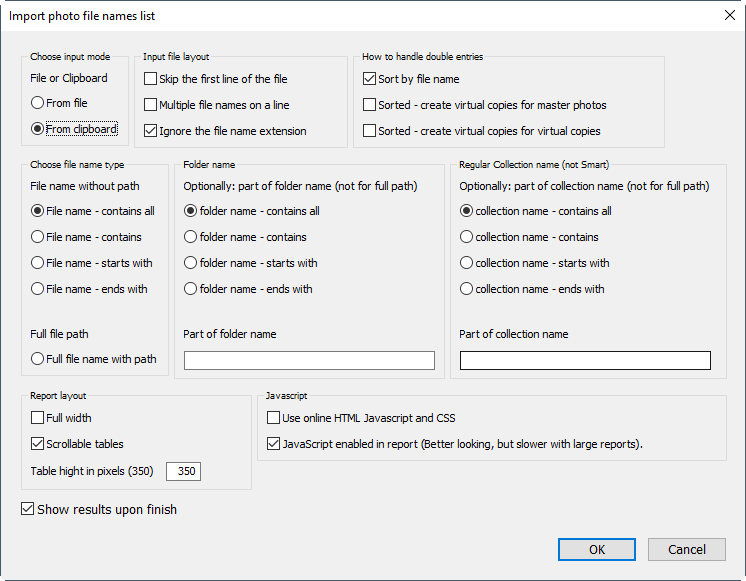 When the user enters a same file name two or more times this option allows the user to have virtual copies created for these extra duplicated entries. The user can choose if only new virtual copies are created for master images or also for existing virtual copies. Default this feature is unchecked. Full file name with the full path. This option is very fast, yet is only usable when you know the full path of the photos. Clients will probably not know this. It is possible to enter (part of) the folder name to narrow down where the photos are searched for. Especially when the customer only gives part of a file name, many photos may be found throughout the catalog. However all the selected photos probably are stored in one folder. It is possible to enter (part of) a regular collection name to narrow down where the photos are searched for. Especially when the customer only gives part of a file name, many photos may be found throughout the catalog. However all the selected photos probably are stored in one collection. BTW, Lightroom has not the functionality to search in a smart collection. These settings control the layout and behavior of the report.